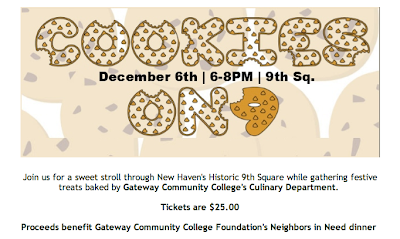 What's Up New Haven: Cookies On9 Event to Benefit "Neighbors In Need"
Cookies On9 Event to Benefit "Neighbors In Need"
You're going to have a busy day on Friday, December 6th! After you participate in the New Haven flash mob in the morning, head on over to 9th Square in the evening for a cookie crawl! A cookie crawl is similar to a pub crawl, but far sweeter: $25 gets you a nice stroll around New Haven's Historic Ninth Square District and the opportunity to collect over a dozen cookies from local shops! 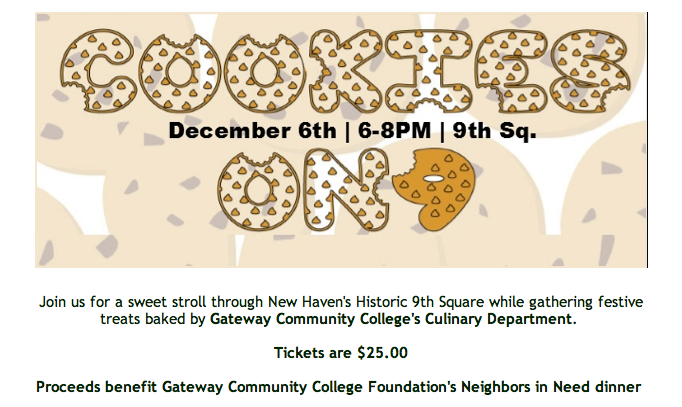 Cookies are baked by the Gateway Community College Culinary Department and ticket proceeds benefit the "Neighbors in Need" dinner hosted by GCC.